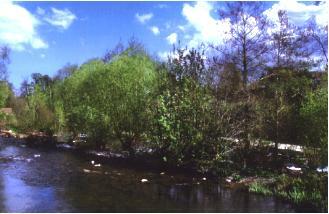 The Mill Street Weir was not initially part of the Trusts restoration programme but became unexpectedly available in April 2003. After prolonged negotiations with Severn Trent, this weir was passed to Teme Weirs Trust with a generous donation towards the repair of the dilapidated sluice gates and weir end. 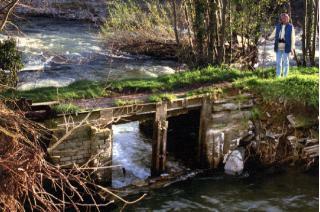 The sluice gates, in very poor condition, had not been operable since the 1950s. A design, tender and build programme was initiated within a desperately tight time scale as work could not extend beyond the end of September because of migrating fish. Coupled with this was some promised funding from the Conservation Area Partnership Scheme, available only if completion could be achieved by the September date, the deadline was met. A summer of wonderful weather ensured that the project was completed on time. The work has resulted in the leat being restored the new embankment being an amalgam of Roman technology with 21st century modifications which has produced a flourishing mix of rushes reeds and grasses which proved to be substantial enough to withstand the torrential storms of 2007. The fully restored sluice gates give control of the river, which can now be diverted from the main weir when inspection and maintenance is required. The original ironwork remains and dates from about 1880 having been cast at a Ludlow foundry. An information board is sited on the railings overlooking the weir. The distinctive panel designed by Think Graphic and illustrated by Alan Duncan shows the life of the river and its environs with informative text. The Trust wishes to acknowledge the generous donation of land from Monica Green to accommodate the restored leat. Work can only be carried out in the river between April and the end of September. 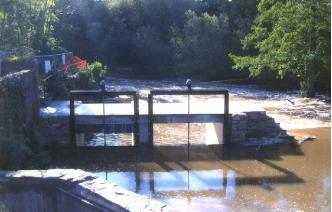 Restoration of Casemill Weir at Temeside, Ludford, Ludlow. Sluice Gate Manufacturer Hambaker Flow Control Ltd.
Key to the design was the need to demonstrate by computer modelling of the river flow characteristics that flows would be at least no worse after the works than was the case before closure of the breach in the weir. A further element imposed by the Environment Agency was a flow control structure to prevent debris and canoeists from being swept down the leat tunnel serving the former mill and at the same time allowing a sweetening flow in the tunnel. The requirements to provide a fish pass, a canoe pass and a low flow notch deemed necessary by the Environment Agency following residents concerns on Summer flows upstream, have all combined to produce a largely dry weir in the Summer. The restoration of this weir presented a different set of problems to the Horseshoe Weir in that it is a linear weir making the task of making temporary dams more difficult. Fish isolated in dry section were stunned by a small electric charge, collected by Environment Agency workers and released unharmed into the main river. 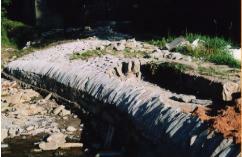 The weir was initially a large concrete structure lacking the charm of the Horseshoe Weir stone construction. However evidence of earlier building techniques came to light during the work in the shape of round timbers with wrought iron pointed tips and dendo dating has been requested. A five metre section of vertical timbering was also found with no sound footing this remains in place since no better affordable technical solution was available. 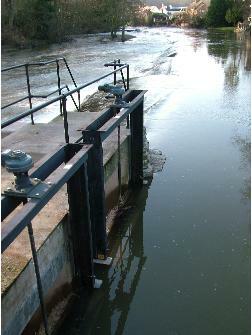 The sluice gates are designed for passive management i.e. no requirement to open and close them to respond to varying river flows. There is however a need to operate them to allow debris to disperse and for weir maintenance. The size of the gate presented difficulties with manual operation but after much research and engineering ingenuity a solution involving a rechargeable portable winding device was invented by the weirs manager. A viewing point accessible from Temside was made possible by the generous donation of part of their garden by the owners of Herons Reach. A disabled parking space is designated near by. An information board is sited at the viewing platform. The distinctive panel deigned by Think Graphic and illustrated by Alan Duncan shows the life of the river and its environs with informative text. A seat has been placed on ground overlooking the river and weir at the bottom of Weeping Cross Lane dedicated by Teme Weirs Trust to the Friends of the Weirs and the people of Ludlow. 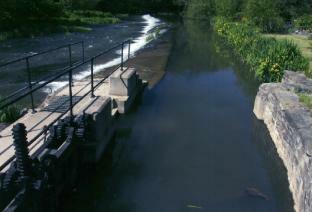 left - the restored gates with Weir stretching beyond upstream. 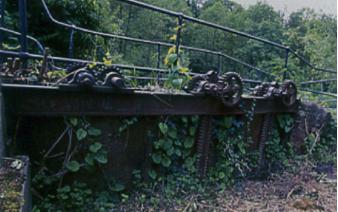 above left - overgrown and crumbling Horseshoe Weir, above right - cleared and restored. 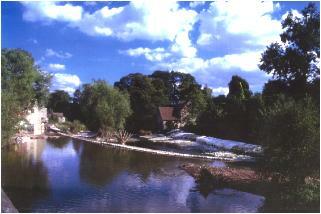 Horseshoe Weir is a listed structure in an area designated as a Site of Special Scientific Interest. The work was carried out under dry conditions, the river having been diverted by building a dam of 1 tonne builders bags filled with locally dug clay. On completion of the work these bags were transported to another conservation project being directed by South Shropshire District Council at Snailbeach. Here used to provide a waterproof lining to several pools being restored at the old Lead Mine Project. Where necessary the original vertical coursing of stone on the surface of the weir was replicated. As far as was practicable the stone used was collected from the bed of the river either that which occurred naturally or had been used in the original weir construction, additional stone was sourced from a local quarry. A canoe pass was installed next to the fish pass. Flood prevention measures incorporated in the design have allowed controlled flows to be maintained in the leats of the now defunct mills on each bank. The restoration of the Horseshoe Weir was completed to tremendous public and professional acclaim, and the visual enhancement to the conservation area was achieved. An information board is sited on the river bank overlooking the Horseshoe Weir at Temeside. The distinctive panel deigned by Think Graphic and illustrated by Alan Duncan shows the life of the river and its environs with informative text. Flood Defence Consent is necessary for any structures in, on or over a river. Work can only be carried out in the river between April and end of September. A DVD or Video is available approx. 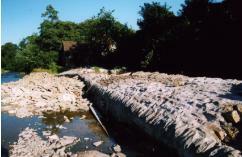 1hour in length showing the Horseshoe Weir restoration - click here for details.